Tax-hike proponents claim there’s no way to fix Illinois’ chronic budget problems without more money. They want Illinoisans to believe the state’s tax revenues simply aren’t enough to cover the cost of government. But tax revenues aren’t the real problem. Illinois’ perennial budget crises stem from the state’s persistent overspending and misplaced spending priorities. The 2016 budget gridlock is the culmination of years of fiscal mismanagement under Illinois House of Representatives Speaker Mike Madigan’s leadership. A look at the state’s budget numbers since Madigan came to power as House speaker shows the state has had ample tax revenues – now and over the past 30 years – but has consistently mismanaged its spending. Illinois has repeatedly prioritized government-worker pay and benefits over core services. That’s led to Illinois’ dramatic fiscal decline and the current budget crisis. State per capita tax revenues have grown 70 percent more than inflation over the last 33 years. As a result, Illinois collected $265 billion more than it would have if per capita tax revenues had only grown at the rate of inflation since 1983. That’s true even during shorter, more recent time periods. From 2003 to 2016, Illinois collected an average of $5.4 billion a year in additional tax revenues per capita, well above what the state would’ve brought in if tax revenues had only grown at the rate of inflation since 2003. 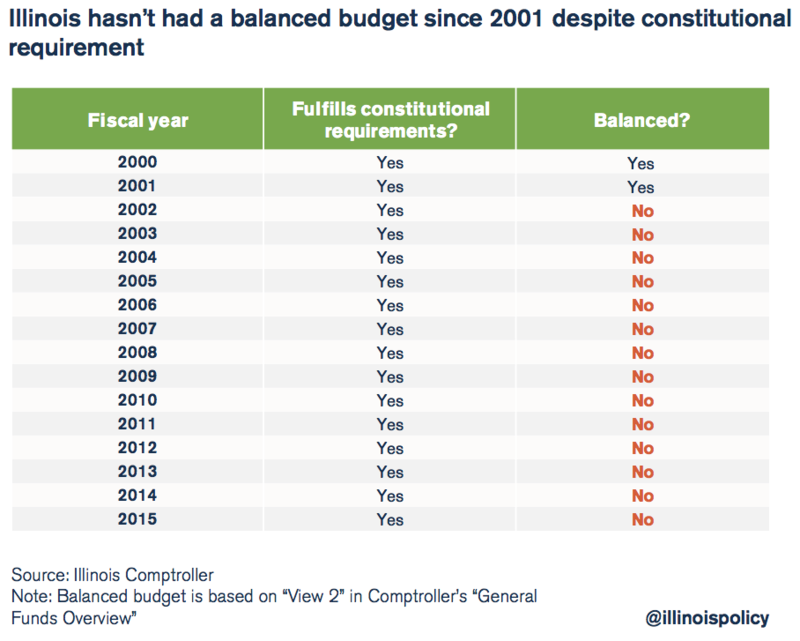 Despite those plentiful tax revenues, Illinois has not had a balanced budget since 2001. That problem will only worsen as the nearly $170 billion in unfunded promises made with respect to state-worker retirements come due. Pension costs alone now consume 25 percent of the entire state general fund budget. The state of Illinois spends a significant portion of its budget on worker pay, health coverage and pensions, which has crowded out funding for core government services. Funding for state-worker pay and benefits increased by nearly 600 percent from 2000 to 2015. That contrasts sharply with funding for core services, which stagnated during that same period. Higher education spending is down 8 percent, human services funding is up only 10 percent, public safety spending is up 12 percent, and funding for K-12 education is up 35 percent. The massive 2011-2014 income-tax hike did nothing to solve Illinois’ fiscal crisis or fund social services. 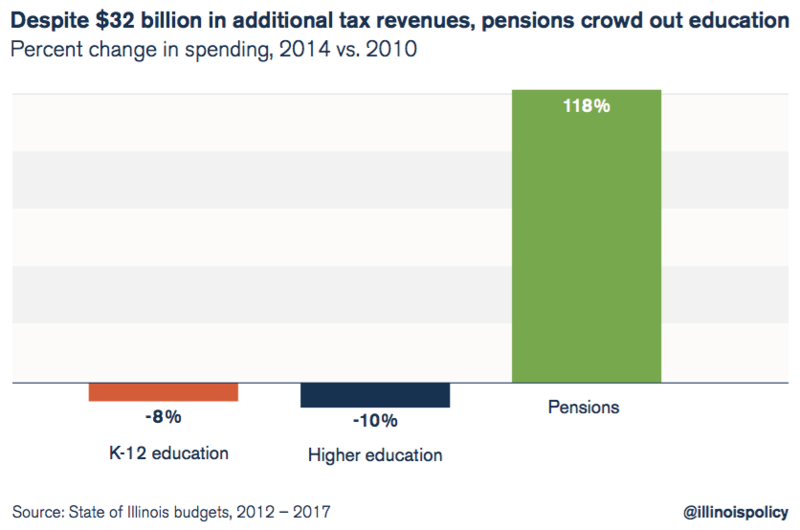 Instead, the additional tax revenues fueled Illinois’ failed spending priorities: government-worker pay and benefits. Politicians doubled payments to pensions during those four years, while funding for K-12 and higher education actually fell by nearly 10 percent. Any tax increases will only put additional pressure on overburdened taxpayers and encourage more residents to seek opportunities in other states. Illinois already has the fourth-highest state and local tax burden as a percentage of income, and that includes the highest property taxes in the nation. The 2016 battle over Illinois’ budget is the culmination of years of fiscal mismanagement. Despite the receipt of more than enough tax revenues to fund core government services, lawmakers have consistently spent more than the state has taken in. And rather than ensure that social services and other vital programs are prioritized, they’ve made state-worker pay and benefits untouchable. That’s why Illinois isn’t funding its social services and universities even though the state will spend at near record levels in 2016. Without significant reforms to the way state government operates, this crowding out will continue. Expenses will continue to outpace inflation and population growth and the incomes of the taxpayers who fund government. Illinois needs a balanced budget, not through tax hikes, but rather through an honest prioritization of spending and real economic growth. The reality is, unless Illinois reforms its core cost drivers and reinvigorates its economy, no amount of tax revenue will ever be enough. Tax-hike proponents claim there’s no way to fix Illinois’ chronic budget problems without more money. They want Illinoisans to believe that the state’s tax revenues simply aren’t enough to cover the cost of government. But tax revenues aren’t the real problem. Illinois’ perennial budget crises stem from the state’s persistent overspending and its misplaced spending priorities. The 2016 budget gridlock is the culmination of years of fiscal mismanagement under House Speaker Mike Madigan’s leadership. Illinois has more than enough tax revenue: State per capita revenues have grown 70 percent more than inflation over the last 33 years. As a result, Illinois collected $265 billion more than it would have if per capita revenues had only grown at the rate of inflation since 1983. That’s true even during shorter, more recent time periods. 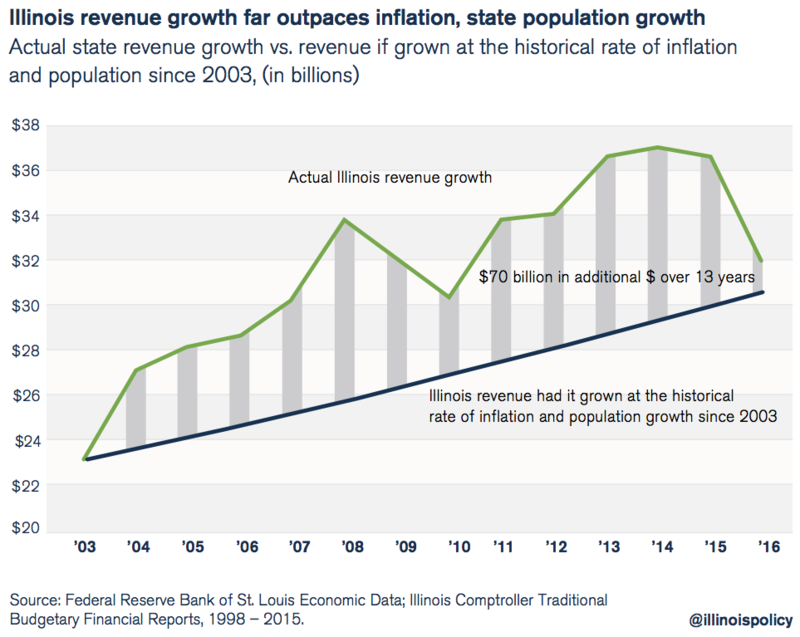 From 2003 to 2016, Illinois collected an average of $5.4 billion a year in additional revenues per capita, well above what the state would’ve brought in if revenue had only grown at the rate of inflation since 2003. Illinois politicians continue to spend more money than the state takes in: Despite those plentiful revenues, Illinois has not had a balanced budget since 2001. That problem will only worsen as the nearly $170 billion in unfunded promises made to state-worker retirements come due. Pension costs alone now consume 25 percent of the entire state general fund budget. Politicians’ spending priorities are misplaced: The state of Illinois spends a significant portion of its budget on worker pay, health coverage and pensions, which has crowded out funding for core government services. Funding for state-employee pay and benefits increased by nearly 600 percent from 2000 to 2015. That contrasts sharply with funding for core services, which have stagnated during that same period. Higher education spending is down 8 percent, human services funding is up only 10 percent, public safety spending is up 12 percent, and funding for K-12 education is up 35 percent. Record tax hikes didn’t fix Illinois’ budget problems: The massive 2011-2014 income-tax hike did nothing to solve Illinois’ fiscal crisis or fund social services. Instead, that revenue fueled Illinois’ failed spending priorities: government-worker pay and benefits. Politicians doubled payments to pensions during those four years, while funding for K-12 and higher education actually fell by nearly 10 percent. Without significant reforms in the way state government operates, primary spending drivers such as state-worker compensation will continue to crowd out funding for other services. But tax hikes aren’t the solution. Any tax increases will only put additional pressure on overburdened taxpayers and encourage more residents to seek opportunities in other states. Illinois already has the fourth-highest state and local tax burden as a percentage of income, and that includes the highest property taxes in the nation. The reality is, unless Illinois reforms its core cost drivers and reinvigorates its economy, the state’s finances – and its tax base – will continue to deteriorate. 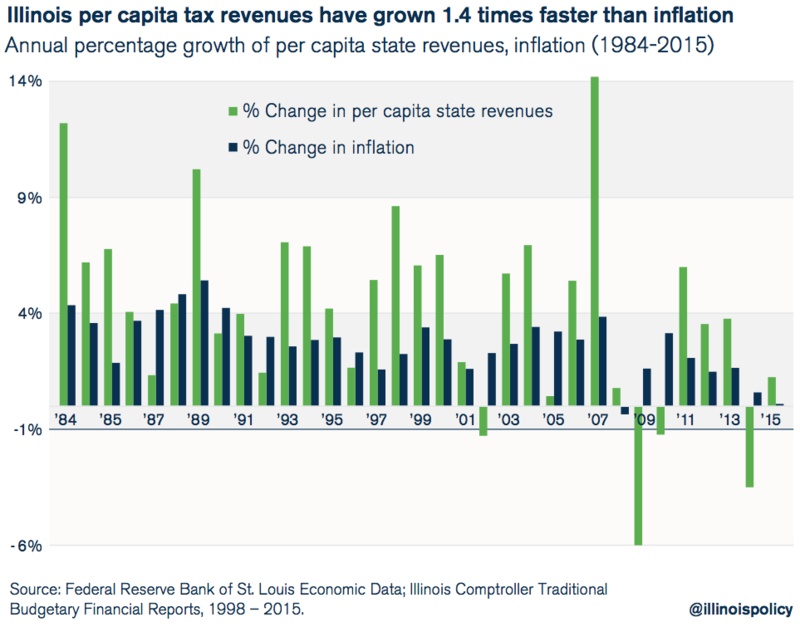 Since 1983, the year Madigan became Illinois House speaker, the state’s per capita tax revenue growth has consistently outpaced increases in inflation. The state’s per capita general fund revenues have grown by an average rate of 3.7 percent each year. That’s faster than the 2.7 percent average annual inflation growth over that period. What might seem like a small difference between tax revenues and inflation – a 1 percentage point difference in growth – adds up to billions of taxpayer dollars when compounded over 33 years. Over the entire period, state per capita tax revenues grew by nearly 236 percent, while inflation rose by just 139 percent. 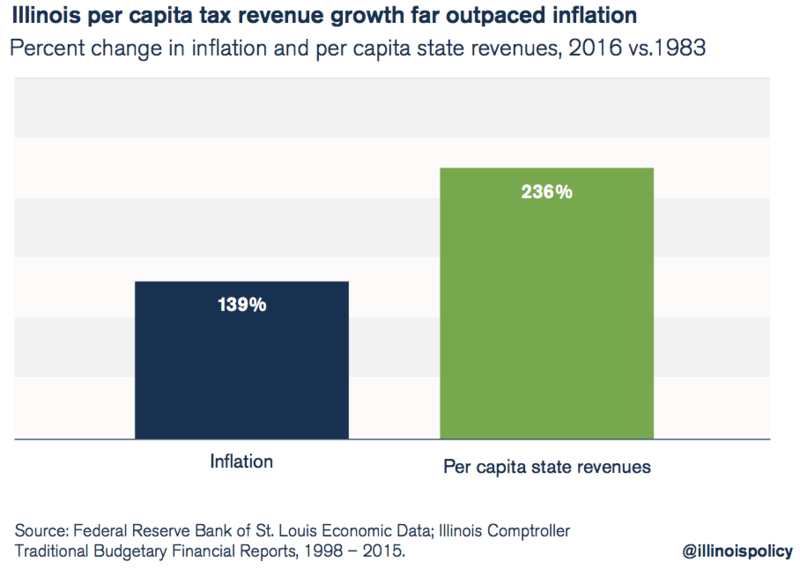 As a result of this difference, over the last 33 years Illinois’ government has had $265 billion more in revenues than what it would have had if state per capita tax revenues had simply grown on pace with inflation. That means that, on average, the state collected $8 billion in additional tax revenues per year compared to if revenues had only grown at the rate of inflation. All of this has had a significant effect on Illinois’ 2016 tax revenues. In 1983, Illinois collected $8.4 billion in total general fund revenues. Over the next 33 years, had those tax revenue collections simply grown at the rate of population plus inflation, the state would have collected $22.7 billion in 2016. Instead, the state expects to collect approximately $32 billion in 2016, or $9 billion more. That $9 billion is larger than the state’s appropriation to its K-12 education budget and larger than the state’s current unpaid bill backlog. More recent budget numbers from 2003 to 2016 tell a similar story. 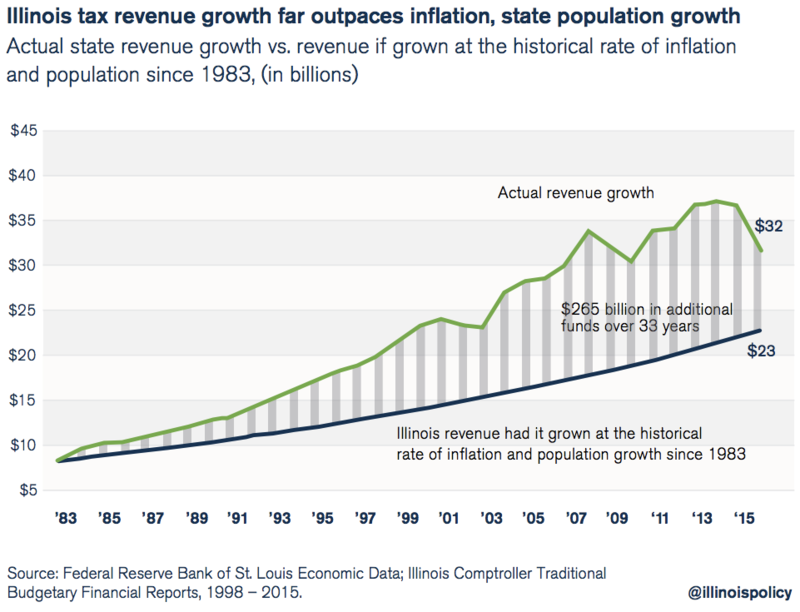 From 2003 to 2016, Illinois state government collected more than $70 billion in additional tax revenues compared to what it would have taken in had state tax revenues simply grown at a pace of inflation plus population growth since 2003. That means, on average, the state collected $5 billion in additional tax revenues per year compared to if revenues had only grown at inflation. In 2016 alone, the state will have an additional $1.3 billion in tax revenues when compared to what it would have had if state tax revenues had grown at the same rate as inflation plus population since 2003. That surplus exists even after taking into account the large drop in state income-tax receipts due to the partial sunset of the 2011 tax hike. 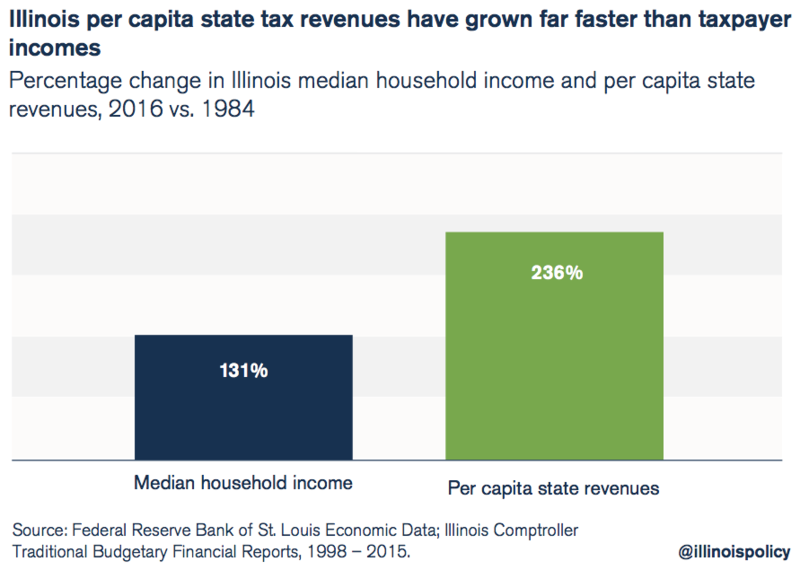 Unfortunately, not only have state per capita tax revenues grown faster than inflation, but they’ve also surpassed the growth in Illinoisans’ incomes. Per capita state tax revenues grew 236 percent versus the 131 percent growth in median household incomes from 1984 to 2016. When adjusted for inflation, Illinoisans experienced growth in incomes from 1984 through 1999, though incomes have collapsed since then. 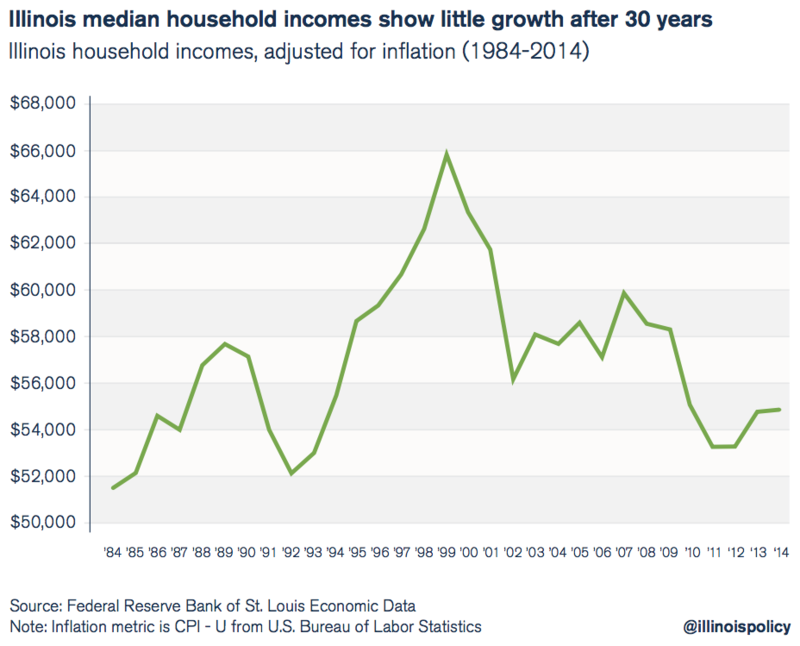 Overall, Illinois’ 2014 median household incomes are only up slightly when compared to 1984. Today, median family incomes are treading water, at best. The collapse in workers’ incomes since 1999, coupled with anemic jobs growth, leaves no room for the burden of additional tax hikes. Illinois’ overspending habits are exemplified by the last 15 years of negative budgetary balance – despite the fact that the Illinois Constitution requires a balanced budget. The last year Illinois had a truly balanced budget was 2001, according to the Illinois Comptroller. That’s because, rather than spend within the state’s means, Illinois politicians have consistently used gimmicks – shifting funds and pushing off unpaid bills into the next year – to get around the Illinois Constitution’s balanced budget requirement. As a result, the state continues to spend more than it takes in; Illinois had more than $7 billion in unpaid bills as of June 2016. Unfortunately, the state’s unpaid bills are just the visible deficits that can be found in the annual operating budget. The true extent of Illinois’ out-of-control spending is hidden in the form of retirement benefits that have been granted to government workers. The present value of the total pension benefits promised to state workers has grown at the incredible pace of 9 percent annually since 1987, to $191 billion in 2015 from just $18 billion in 1987. That growth rate far surpasses the growth rates of state revenues, inflation and taxpayer incomes during the same period. Unfortunately the state has set aside only $80 billion of the $191 billion it needs to have today to pay for state workers’ future benefits, meaning there is $111 billion in pension debt that has yet to be funded. Due to the combination of pension benefit growth and underfunding, pension costs now consume more than 25 percent of the state’s general fund annual budget, up from just 8 percent in 2004. The state has also promised retirement health care benefits to state workers. 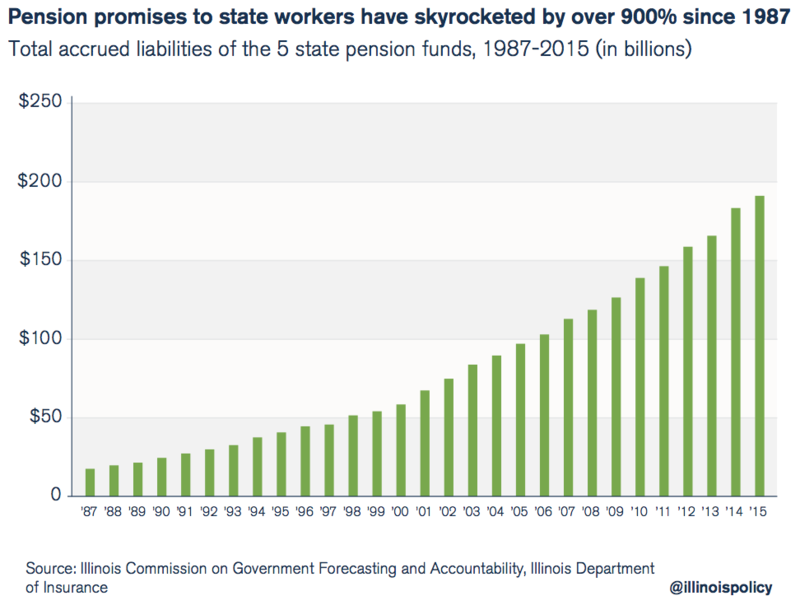 The cost of those promises now stands at over $56 billion, nearly half the size of Illinois’ unfunded pension debt. But unlike pensions, Illinois has no money set aside to pay for those future health care costs. Without reforms, those massive and growing costs will continue to crowd out spending for other core government programs including education and social programs. In total, there’s an additional $170 billion in debt for state-employee benefits that have yet to be paid for. Because Illinois politicians continue to resist enacting major spending and pension reforms, much of Illinois’ spending is programmed to rise automatically. That means the major cost drivers, including pensions, state-worker benefits and Medicaid, are crowding out core government services. In 2015, total state tax revenues were $13 billion, or 57 percent, higher than they were in 2000. That growth contrasts sharply with how funding for several key items changed between 2000 and 2015. Since 2000, politicians’ spending on employee compensation and other cost drivers has not only outpaced spending on various core services, but in some cases actually caused some services, such as higher education, to lose funding. Tax-hike proponents argue that tax revenues will solve this problem, but this pattern of misplaced priorities cannot be fixed by additional tax revenues. 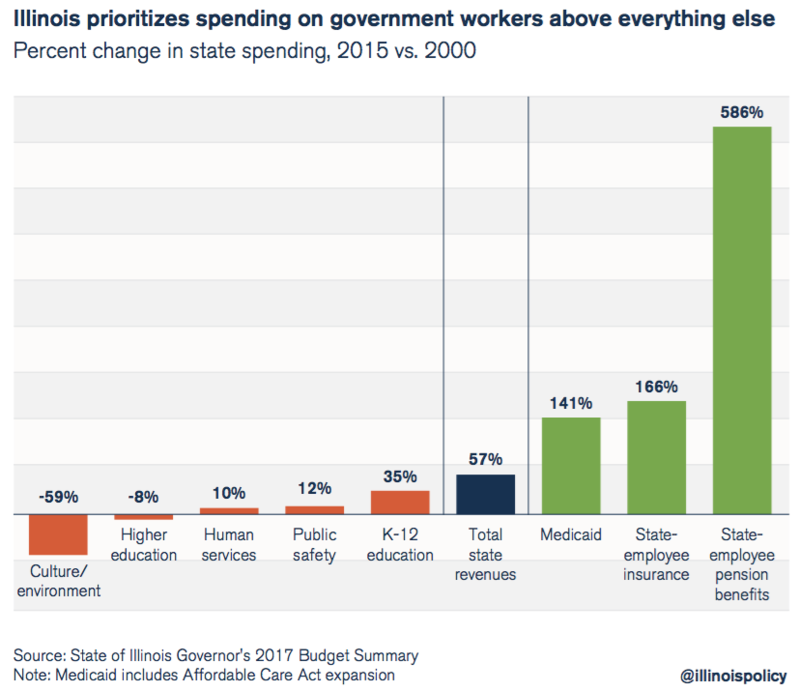 The budgets of the last 15 years show that, despite more than adequate tax revenues, Illinois politicians will avoid reforms and overspend on their favored programs rather than provide for the social and core services they verbally champion. In 2011, Illinois politicians enacted a record 67 percent personal-income-tax hike and a 46 percent corporate-income-tax hike. The tax increases were designed to last for four years, partially sunsetting in 2015 before sunsetting fully in 2025. Springfield politicians promised the additional $32 billion in revenues from the hike would be used to resolve the pension crisis, pay down the state’s unpaid bills, and fix the state’s budget. But the hike accomplished just the opposite of its stated intent: The pension crisis wasn’t fixed, Illinois’ bills weren’t paid down, and spending for other government services either decreased or stayed relatively flat. This boost in revenues allowed politicians to avoid any real reforms. Instead, those additional revenues were funneled to state-worker pay and pensions – with politicians making no effort to comprehensively reform Illinois workers’ pensions or the state’s spending habits. Even an extra $32 billion in revenue didn’t stop politicians from prioritizing pensions over many needed core services. Lawmakers grew funding for pensions by 118 percent, while funding for education fell by 8 percent for K-12 and 10 percent for public universities and community colleges. Illinois politicians squandered the tax-hike revenue by throwing that money at the pensions they failed to reform. Now tax-hike proponents are coming back for more, demanding more tax revenues to supposedly fund the social programs they’ve effectively ignored for years in favor of worker pay and benefits. Until lawmakers enact significant governance, financial and economic reforms and learn to live within the state’s means, they don’t deserve the right to ask taxpayers for more money. Without significant reforms to the way state government operates, this crowding out will continue. Expenses will continue to outpace inflation and population growth and the incomes of the taxpayers that fund government. Lower the cost of government by creating a more realistic retirement plan for state workers, as well as a collection of other reforms, including optional 401(k)-style plans for existing employees. Demand a truly balanced budget to ensure spending doesn’t outpace revenues. Push for consolidation of Illinois’ more than 7,000 units of government, starting with merging many of the state’s 859 school districts. Reform how Illinois delivers K-12 education to children and demand public universities cut administrative costs. Reform Medicaid spending practices to deliver better care and save taxpayer dollars. Pass a spending cap to keep core cost drivers such as employee compensation in check. Reduce the overall property-tax burden to make Illinois more affordable. Reform Illinois’ workers’ compensation system so it is more in line with those in other states. Reduce the burden of occupational licensing on small businesses and entrepreneurs. End prevailing-wage laws, which harm Illinois’ manufacturing sector. The reality is, unless Illinois reforms its core cost drivers and reinvigorates its economy, no amount of tax revenue will ever be enough.